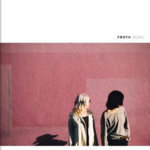 Eve McGivern Their earlier album, Bleak, is comprised of decent but pretty straightforward guitar shoegaze. This one, though? 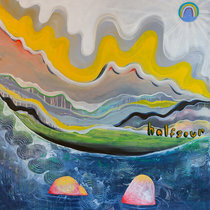 It’s got the best shoegaze elements going for it, but is touched by electronics, guitar freakouts and jangle interplay a la Kinski or Ride, elements of 60s psychedelia (Asteroid #4, Apples in Stereo), and the occasional Krautrock influence. omena Fell in love with their 2017 KEXP performance and decided to get this album. Beautiful work. Favorite track: Passing Thing. 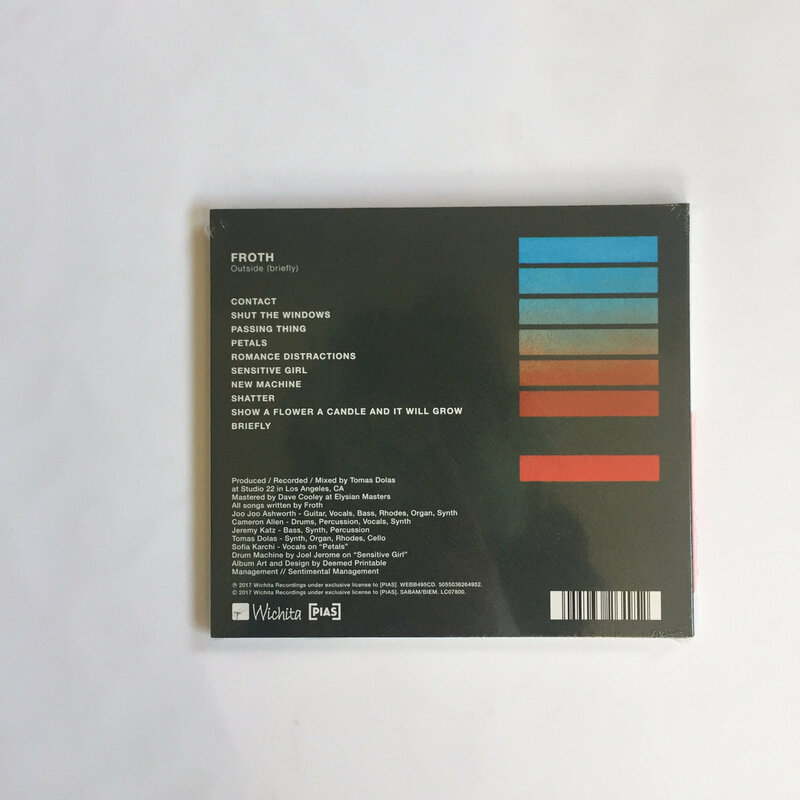 Digipak sleeve, artwork by Deemed Printable. Includes unlimited streaming of Outside (briefly) via the free Bandcamp app, plus high-quality download in MP3, FLAC and more. 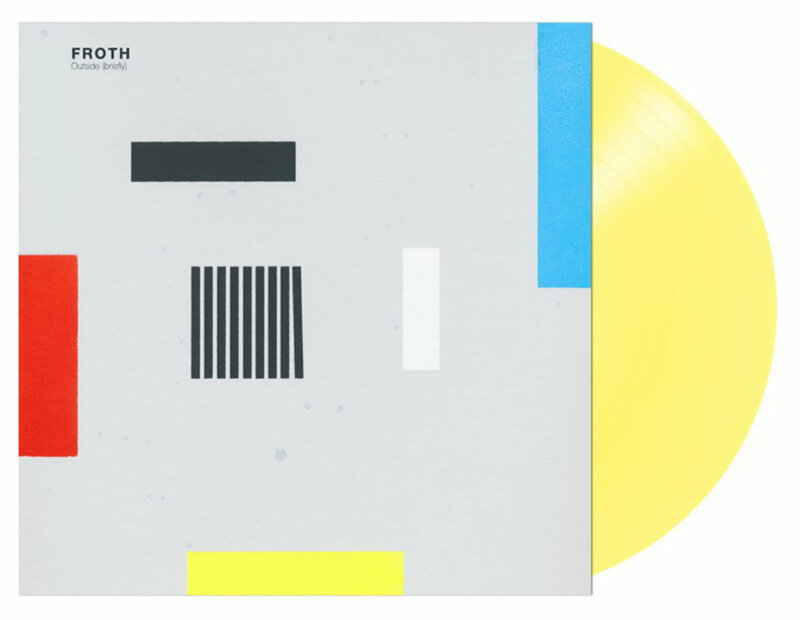 Limited edition pressing on yellow vinyl. Includes lyric insert. 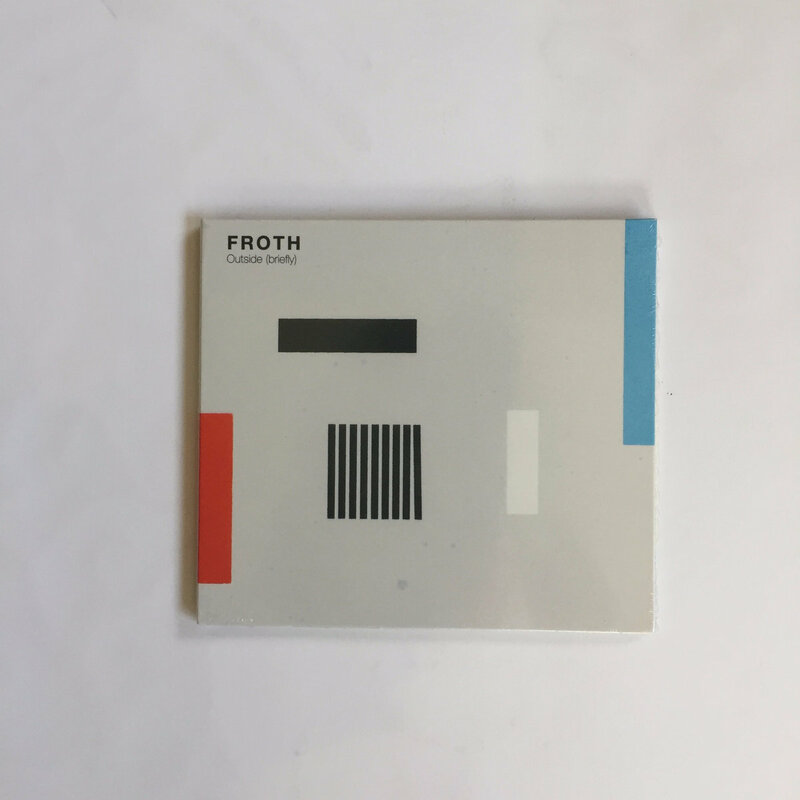 The Thomas Dolas-produced Outside (briefly) is the sound of a band that’s truly found its voice, and in many ways feels like Froth’s proper debut. Across the ten songs, the band dialed back the noise and psych-pop found on their previous LPs to reveal delicately beautiful melodies, intricately arranged instrumentals, and some of their most experimental songwriting to date. This evolution revealed new dynamics of Froth’s sound, resulting in a moodier and more atmospheric bend to their shoegazing melodicism and pop sensibilities, mixing the driving, tuneful drone of first single “Contact” alongside the epic squall of the intertwining guitars on “Passing Thing” and the more spare, meditative landscape of “Show A Flower A Candle And It Grows” (featuring lead vocals from drummer Cameron Allen). Whereas previously they operated mainly as a guitar-driven band, here finds songs augmented by highlights of cello and synths (courtesy of Dolas), as well as drum machines, Rhodes, and other keys. 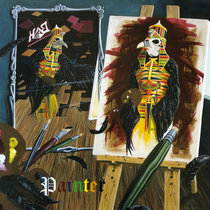 Lyrically, Ashworth found the works of authors Richard Brautigan (the album title comes from a chapter in one of his books) and Haruki Murakami as a fitting inspiration for the dark beauty of Outside (briefly)’s music. 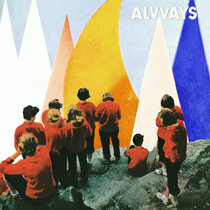 The result is their most varied yet cohesive work to date: a refined studio effort that no longer feels like a documentation of a live band of a collection of songs, but rather a complete, full-bodied album. Outside (briefly) was written throughout late 2015 – following the release of their sophomore LP Bleak – and into this year, and recorded to tape with Dolas in Los Angeles over 40 days in May and June; the ample local studio time allowing for experimentation and contributing to the homegrown, relaxed feel of the album. 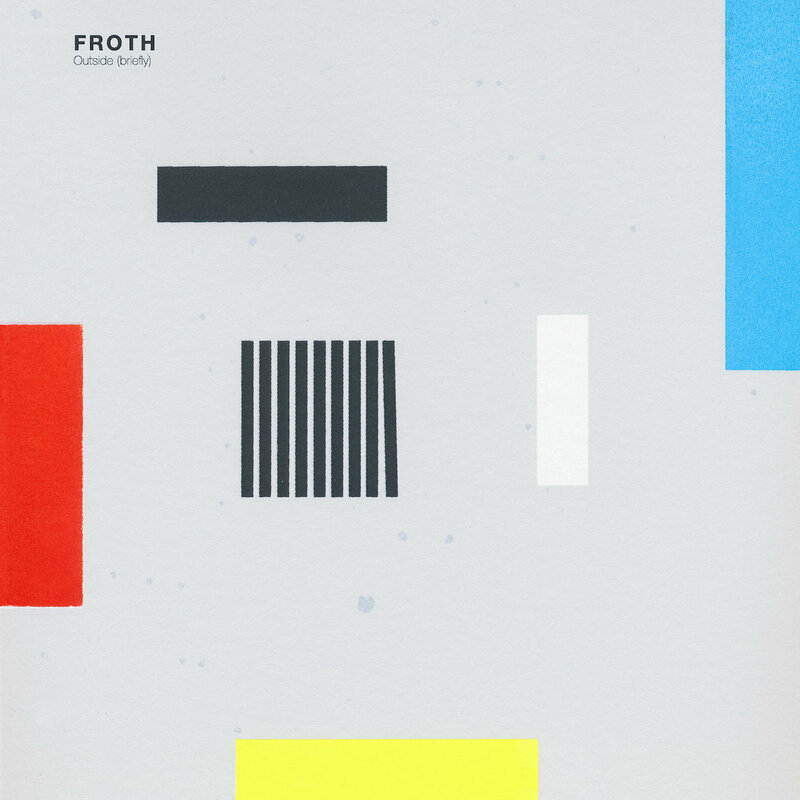 Formed in Los Angeles in 2013, Froth first garnered attention with their debut LP, Patterns. 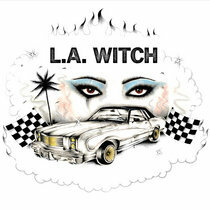 Originally intended as a small-run cassette release, the album quickly became an underground sensation in the Southern California music scene, catapulting the band to local fame and prompting a vinyl re-release in 2014. 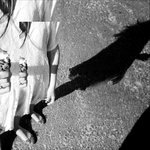 The following year saw the arrival of Bleak, a more dynamic, adventurous effort that matched lush shoegaze soundscapes with driving krautrock beats, and earned the band press attention from outlets including NPR Music, Noisey, Vogue.com, and Stereogum, among others. 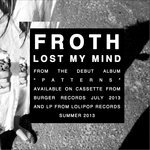 Froth toured extensively across the U.S. and Europe in support of the album, opening for acts such as The Drums, Tamaryn, Pond and Craft Spells. Produced, recorded and mixed by Tomas Dolas. 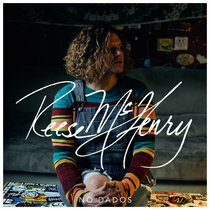 Recorded at Studio 22 in Los Angeles, CA. 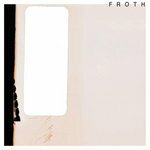 All songs written by Froth. Copyright Control. 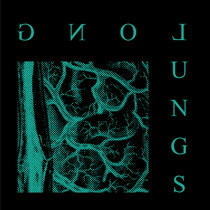 Album art and design by Deemed Printable.